Once you have added Virto SharePoint Alerts to the site page, you have to adjust the web part. 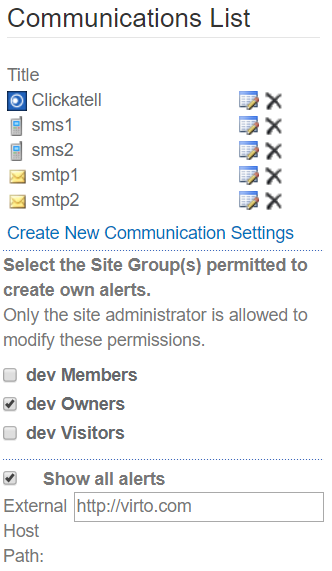 There you have to create a new communication type (smtp or sms), select user groups allowed to create alerts, and you can also define an External host path. Click ”Create new communication settings” to add a new communication type. In case the global server is not adjusted, the e-mail messages can’t be sent. Please ensure the smtp server is properly adjusted and doesn't have security restrictions, which are interrupting alert email delivery.